If I had the choice of taking a piece from the New York Museum of Modern Art‘s collection, it would be this chest of drawers made by Dutch designer Tejo Remy in 1991. 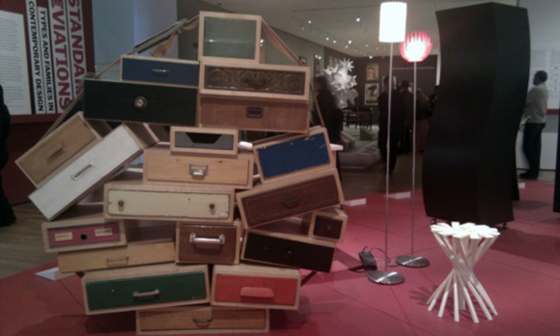 Aptly called “You Can’t Lay Down Your Memory”, the dresser is featured as part of the Standard Deviations exhibition of objects and designs in the Museum’s collection that belong to families. It’s made from mismatched second-hand drawers held together by a rough belt. It looks a lot like a pile of suitcases bundled together for travel, the kind you’d use to keep tokens and souvenirs (all memore fragments) and carry them around from one place to the other.